You know they say that the older you get the faster you get old. That must be why time flies by as we age. It's the middle of summer already. It's the middle of the week already. Wow! I've been thinking that I might try my hand at painting some of my dolls. You know... kinda of simple paintings. I don't know if I can do that or not. A problem I have is not being able to focus for very long. 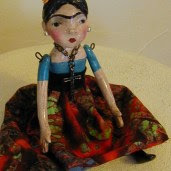 First I paint angels, then I make dolls, then I make jewelry, then I paint again. I really wish I could focus. I think it is a disease with me. I'll try some new stuff tonight and if it turns out ok I'll post it tomorrow. I like to do lots of different things, also. That's why I think of myself as a mixed media artist, I don't really want do just one thing. I guess we all have different ways of working on things, but that works for me.